Ballistics by the Inch conducts the best independent, grass roots ammunition tests. Their process is simple and intensive. They have 18-inch barrels made for various a specific caliber. With the help of a Thompson Center receiver, they test fire different brands of ammunition and calculate the various muzzle velocities. Then they chop an inch off the barrel, recrown it and do it all again. They cut down the barrels until they have a little 2-inch nubbin left, and then publish the results. After they test their single shot barrels (which allow the highest pressures these rounds are capable of reaching), the team from BBTI tests whatever “real world” guns they can get their hands on (which allows for cylinder gap and blow-black discrepancies) . And they post those results, too–just for comparison. And now they’re settling another debate. 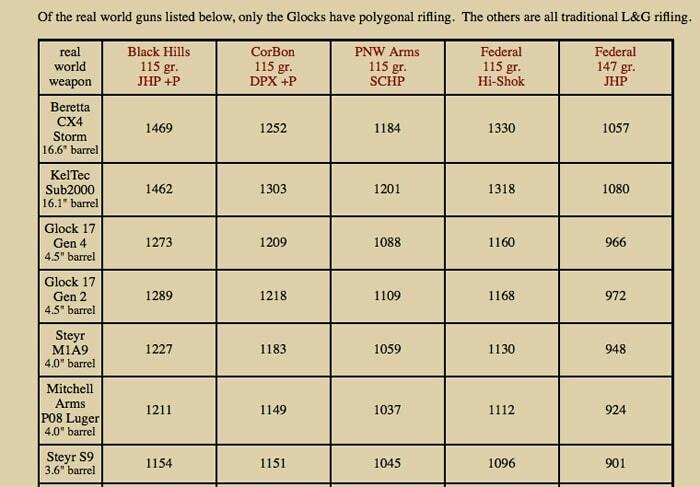 Which rifling type is faster: traditional lands and grooves, or the Polygonal rifling made famous by Glock? The two main types of rifling. Smoothbore barrels simply throw projectiles in the direction the barrel is pointing. Functional, especially if one barrel is throwing multiple projectiles (like a shotgun). A rifled barrel grooves cut inside the barrel. The lead (or copper) of a bullet catches these grooves (which spiral down the length of the barrel). When the bullet leaves the barrel, it spins. That spin ensures that the projectile holds its trajectory more effectively. The metaphor most commonly use compares the spinning bullet to a spiraling football. To complicate this little bit of science, you add in various materials in the construction of the bullet. And then alter its shape: flat nosed, ball, hollow point, wad-cutter, boat-tail, etc. The length of the barrel matters, and the powder load can change the results. The results are well accepted. The argument against traditional rifling focuses on the energy that may be lost if the bullet doesn’t seal the barrel. If the bullet simply skates along the lands, but doesn’t mold itself into the grooves, gas may leak out and reduce bullet speed. A barrel with polygonal rifling doesn’t have the sharp lands and grooves of traditional rifling. Instead, the inside of the round barrel is shaped more like a polygon. In theory, there are no grooves through which gas could escape. The inside of the barrel has flat segments that spin the bullets, but no true grooves through which gas might leak. In reality, especially in the barrels of Glocks, there are still lands and grooves. The corners of the polygonal shape are rounded over. And the walls have a very slight hump. But these barrels are noticeably different. The idea is that the bullet will seat in them more completely. A better seal will, in theory, produce a faster projectile. But does it? BBTI performed their usual chop tests, only this time with polygonal barrels. They fire their allotted test rounds (10 rounds from each selected brand, weight), chronograph the results, and then chop an inch off the barrel and do it all again. As they use long barrel blanks for their testing, BBTI isn’t testing true Glock barrels, at least not in the chop tests. They procured both traditionally rifled and polygoanlly rifled from Lothar Walther. As the barrel length decreases, the power diminishes. And in some cases, the polygonal barrels performed exactly as they are supposed to. 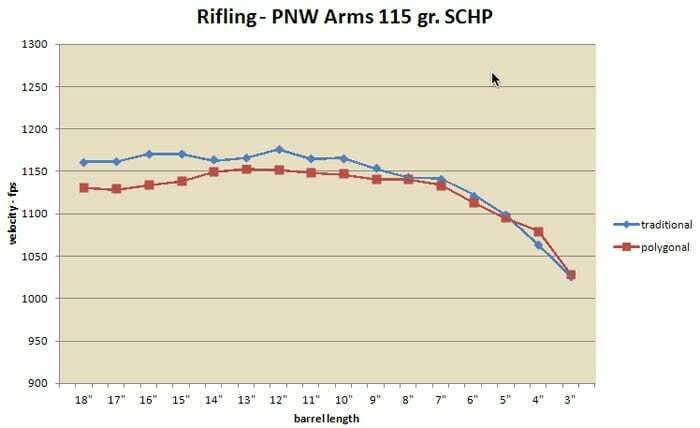 PNW Arms 115 grain SCHP produced consistent power, but inconsistent results. 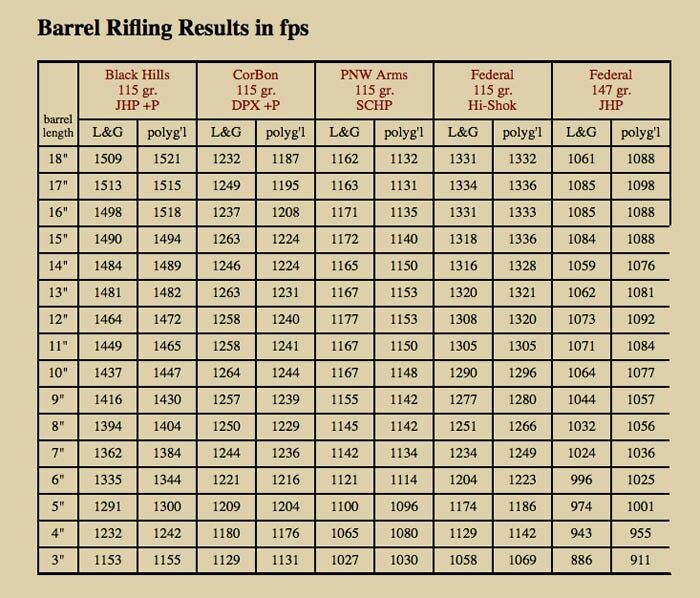 Up to 4 inches, the polygonal rifling is winning the debate. After that, traditional rifling seems to have the edge. In some cases, like that of the Corbon, there seems to be no benefit at all from the polygonal barrels. 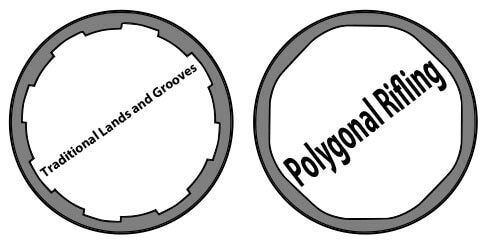 The conclusions from this case are hard to swallow for diehard supporters of polygonal barrels. There isn’t a significant benefit. At most, the polygonal rifling produces only marginally faster shots, even in a real Glock. These results suggest that the polygonal rifling may also slow things down, but only marginally. At best, the rifling doesn’t seem to hurt. Here are the same rounds fired through a number of production model guns. Here are all of the results of the chopped barrels in a easier chart. 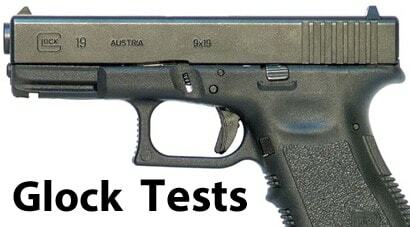 For more on the Glock Tests, check out BBTI’s page. 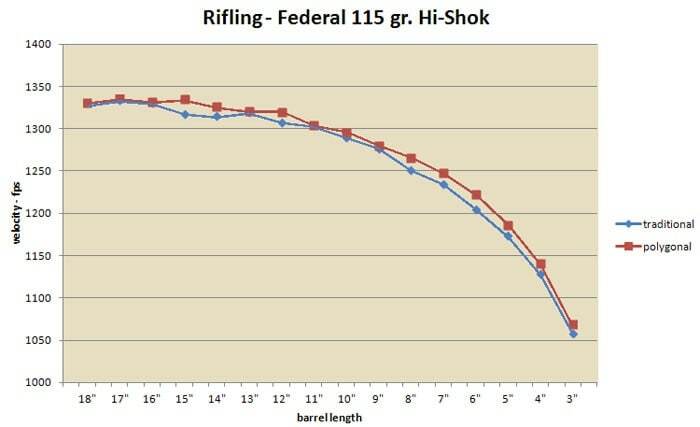 And for an interesting look at the loss of velocity from pistol caliber rounds fired through long barrels, check out BBTI’s blog.